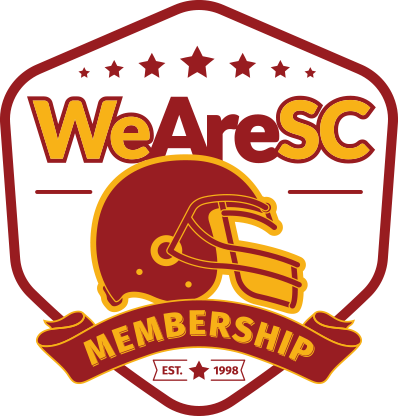 USC’s first scrimmage of spring ball took place Saturday morning in front of a large group of fans, recruits, and former players, which provided a nice environment for some tackling and some live game simulation. 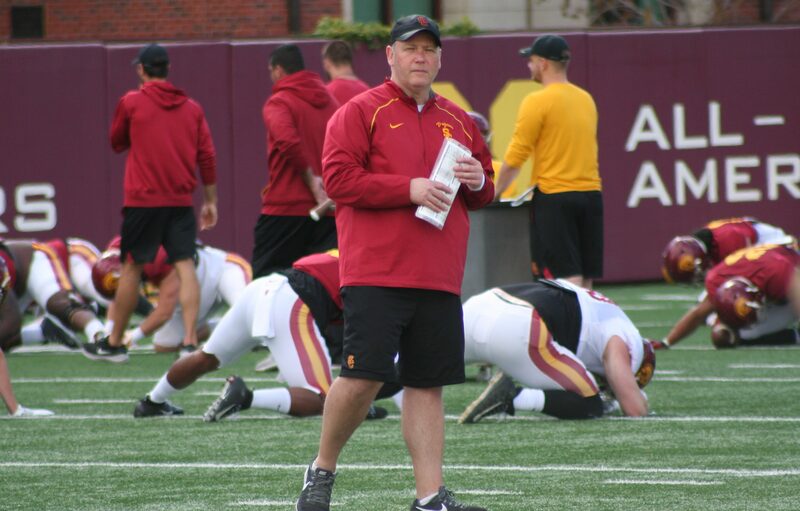 Saturday’s practice wasn’t completely a scrimmage, as the Trojans went through their customary individual drills, special teams work, one-on-one and seven-on-seven periods, and team drills before finishing the day with some live tackling in game situations. Offensive coordinator Graham Harrell’s offense is still relatively new to USC personnel, but head coach Clay Helton was excited to see it in action on Saturday. “It was neat to see how fast things go within this offense and how fast you’ve got to communicate and get lined up for the next play,” Helton said he told the team after practice, adding that today was a bit of a “reality check” because it showed the team just how quickly things move and how important it is to not get caught up in the aftermath of each play. Stephen Carr and Vavae Malepeai returned to the field after missing Tuesday and Thursday practices. Helton said both were battling the flu. The running backs were able to take part in early drills, but sat out the scrimmage portion of the day. Safety Talanoa Hufanga injured his shoulder area when he appeared to get his feet tangled with a receiver downfield. Helton said “something tweaked” when Hufanga fell, and added that it looked like the same arm Hufanga injured last season. Hufanga broke his collarbone in a game against Arizona State in late October, but Helton was unable to confirm the extent of this injury. Quarterback Kedon Slovis, linebacker Solomon Tuliaupupu, and defensive lineman Caleb Tremblay all sat out practice. Running back Markese Stepp has had a terrific spring and continued that today with a few big plays. One on possession beginning on the 25-yard line, Stepp was tackled by two defenders at the line of scrimmage, but somehow managed to keep his balance and took off for 15 yards, dragging a few more defenders with him at the end of the play. The next play was a 10-yard run down to the goal line where again he dragged at least four tacklers for a few extra yards. From there, it was a simple leap into the endzone for a touchdown. Just for good measure, Stepp also took a quick throw during 7-on-7 work and turned upfield for a long touchdown. The offensive line starters remained the same as what we’ve seen thus far, with Austin Jackson, Alijah Vera-Tucker, Brett Neilon, Andrew Vorhees, and Jalen McKenzie. Defensively, Connor Murphy continued to see action with the first team, joining Jay Tufele, Marlon Tuipulotu, and Christian Rector up front. 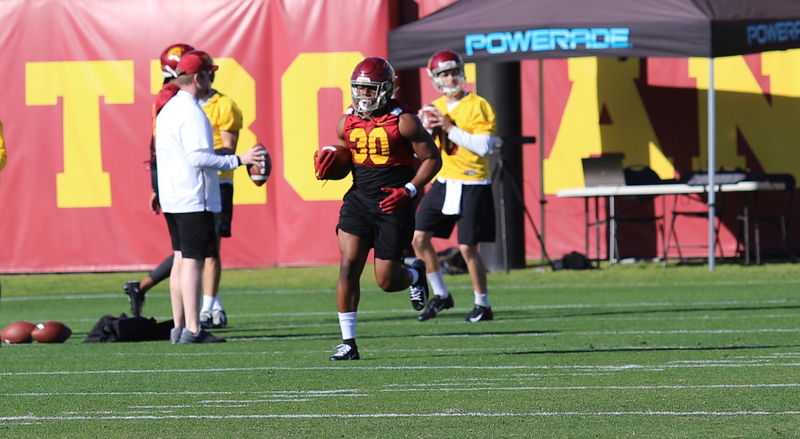 John Houston, Palaie Gaoteote and Eli’jah Winston were at linebacker, with Greg Johnson, Isaac Taylor-Stuart, Chase Williams, Talanoa Hufanga, and Isaiah Pola-Mao in the secondary. Briton Allen had a few noteworthy plays, as he got the better of Devon Williams on one rep, where Williams had the ball drop into his arms on a deep route along the sideline, but Allen was able to stay with it and rip it out before it could be counted as a catch. Allen also came up and delivered a nice pop on Stepp on the first play with live tackling. We’ve talked at length about what a chore it is to bring Stepp to the ground, so it was impressive to see Allen go in hard. Williams came back against Allen a little after that pass breakup and was able to haul in a pass under almost identical circumstances. This time, Allen tried to rip the ball away but Williams held it firm for a touchdown. Amon-Ra St. Brown put on a show during one-on-one drills. He got deep on two long passes, hauling in one that dropped in directly over his head, à la Willie Mays, and then brought the next one in with his fingertips, as he had to fully stretch on a dead run. He came back a short time later to bring in a touchdown pass with one hand, fully extended over his head as he was leaping backwards. St. Brown also got the better of Raymond Scott in coverage, as JT Daniels rolled out and found St. Brown behind the safety for a long throw and run touchdown. His day was also able to end on a pleasant note, as during a non-tackling portion of practice, Jack Sears found him heading toward the sideline and Isaac Taylor-Stuart avoided delivering what would have been a huge hit. There were plenty of ‘ooohs’ from the sideline for what could have been a big collision. Before the injury, Hufanga made a nice play where he undercut a route, came up with an interception, and took off the other way with the ball. Matt Fink had a few balls tipped today. The first one was knocked up in the air during team drills and eventually intercepted by Chase Williams. Another ball was tipped at the line of scrimmage and intercepted by Drake Jackson. Though Jackson’s return was cut short by wide receiver John Jackson III, who forced a fumble that was recovered by offensive tackle Liam Jimmons. Fink had another pass batted up in the air by two defenders downfield before his wide receiver came back to grab it for a completion. John Jackson III had a nice day, as he combined with Erik Krommenhoek on a pair of nice downfield blocks, as well as put a nice move on a cornerback to gain some extra yards after a completion. The defense had the upper hand during the live tackling portion with the second units, as Juliano Falaniko recorded a pass breakup, then Hunter Echols and Abdul-Malik McClain picked up back-to-back sacks. McClain had a nice play later where he went up in the air at the line of scrimmage and was able to adjust and come away with a pass deflection. Taylor-Stuart might have gotten away with a tug on Michael Pittman’s jersey when he knocked away a pass, but there were no flags and the play by Taylor-Stuart was still impressive, as he continues to step up and announce himself at cornerback this spring. Practice ended on a nice catch from Tyler Vaughns, who made an athletic move to get enough of his balance to stretch the ball over the goal line for a touchdown. Adoree’ Jackson, Uchenna Nwosu, Rasheem Green, and Mark Sanchez were just a few former Trojans in attendance. 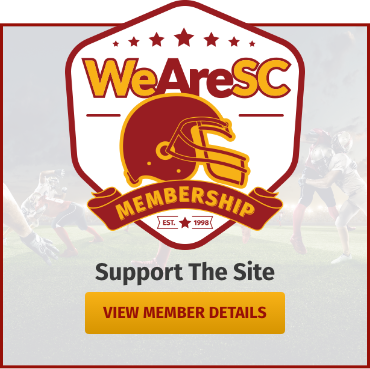 Tennessee offensive tackle transfer Drew Richmond was on a visit to USC. Narbonne wide receiver Josh Jackson announced his commitment to USC shortly after practice ended. The Trojans hosted a massive junior day following practice, so it was a literal who’s who of recruits in attendance. USC quarterback commit Bryce Young was on hand, and the Trojans extended offers to wide receivers Logan Loya (St. John Bosco) and LV Bunkley-Shelton (Serra) following practice. Both receivers are technically proficient and make a lot of sense as slot options in this offense. LSU defensive tackle commit Jordan Berry (Narbonne), former Oklahoma cornerback commit Darion Green-Warren (Mater Dei), and 2021 Oregon running back commit Seven McGee (Narbonne) were just a few other recruits in attendance.